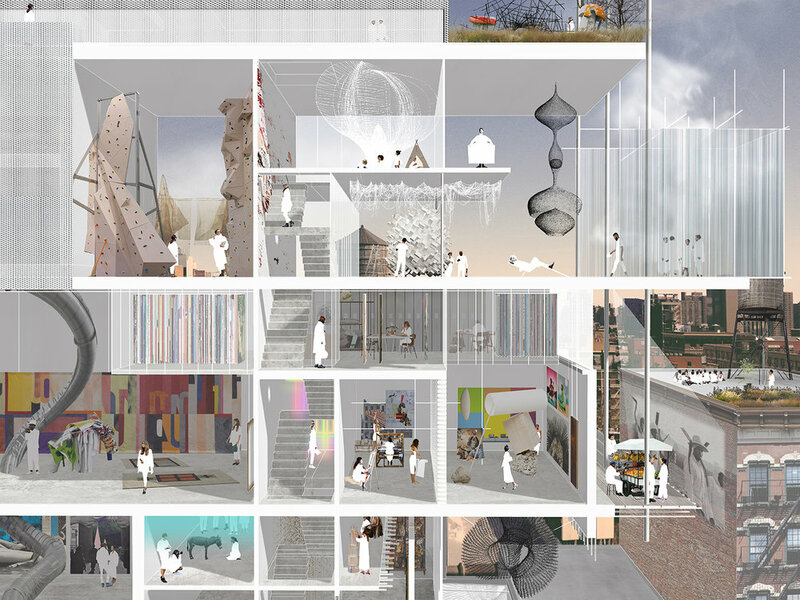 This thesis project will expand on SAANA’s New Museum, using existing and new architectural conditions. The expansion includes repurposing the adjacent building Bowery 231. Bowery 231 was built in 1920 and is part of the historic 1.5 mile of Bowery, the oldest thoroughfare on Manhattan Island. Currently the New Museum program includes, three gallery floors, two office/educational floors and one multipurpose room. The New Museum exhibits living artists of the past 10 years and its mission is enhancing the free flow of ideas and people. The expansion will add new gallery spaces and two new programs, artist studios and archives. In museum design, from present to past, architecture has not been an integral part of the art experience, it has shelled and made interior voids and left vague the interior spaces where art will reside and interactions are meant to emerge. 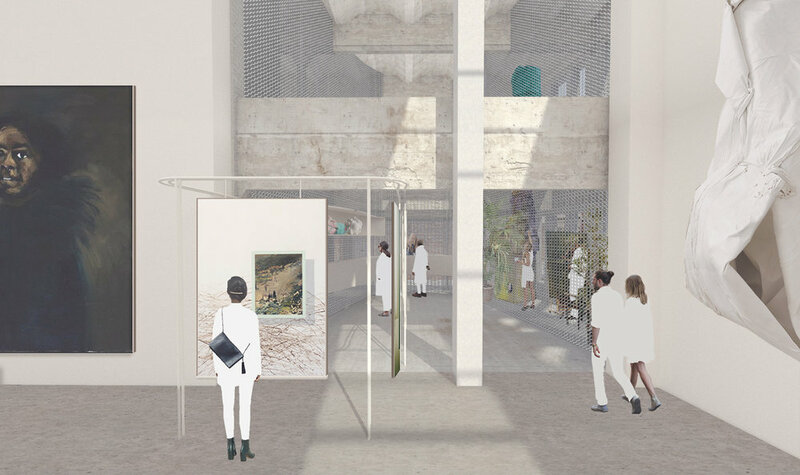 This thesis, inspired by the New Museums mission and the stakes found in museum design, proposes a new museum experience for visitors, artists and the back of house. 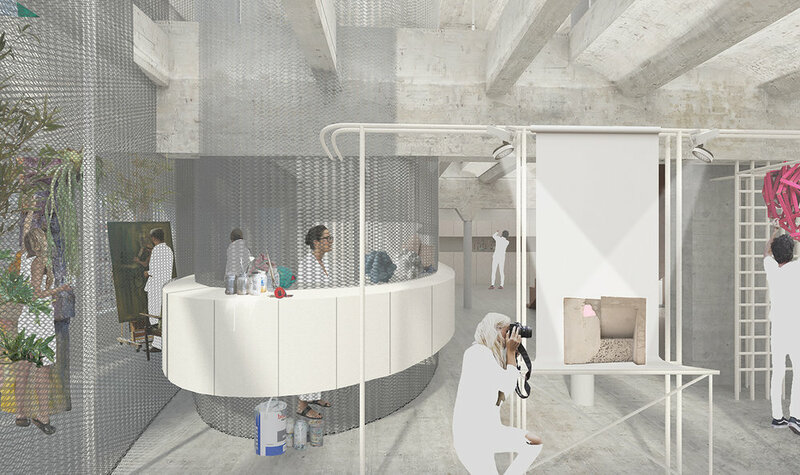 Architecture will not only shell and creates voids but in addition it will permeate the interiors physically and visually connecting the primary programs of the museum. Architecture will be in direct discourse with all the phases in and behind art. 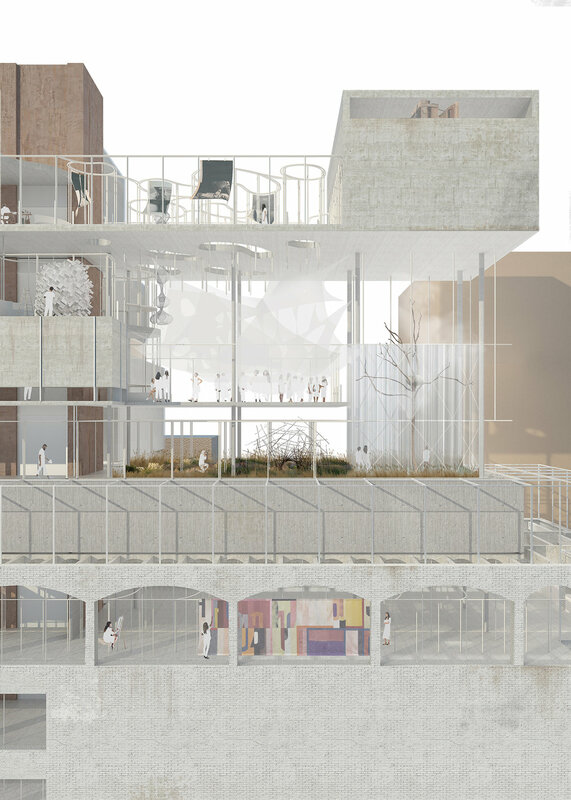 The center of the structure will house a new circulating core that will lead the visitors through a series of experiences, for example exiting the elevator or stairs and directly see a studio allowing the user to move around the studio that will lead to the gallery. The new core will go through the original structure and pierce out exposing the three programs in a more condensed manner. The archives and the studios are interlocked between the new galleries spaces and pierce in the existing galleries by specific openings through the separating lot walls, allowing for the existing galleries to remain with its large scale voids. The openings lead visitors into a more concentrated ambiance, lower ceilings galleries and the visually exposed studios and archives. Through these voids a system of display apparatus will guide visually users towards the studios and the archive. The apparatus allows the visitor to see and be part of the real structure in art. 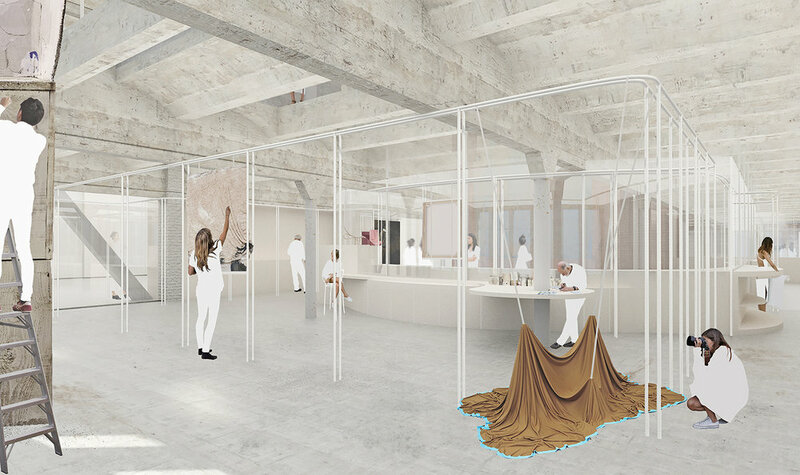 Its center will house a new circulating core that will lead the visitors through a series of experiences, for example exiting the elevator or stairs and directly see only the workshop, allowing the user to move around the workshop that will lead to the gallery. 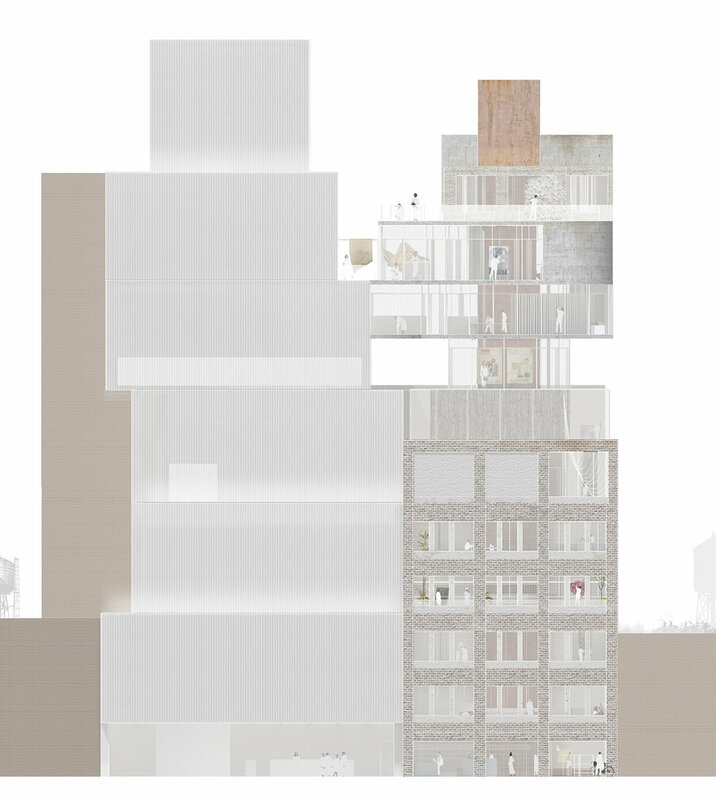 The new core will go through the historical structure and pierce out exposing the three programs, giving the visitor a multiplicity of gallery spaces. 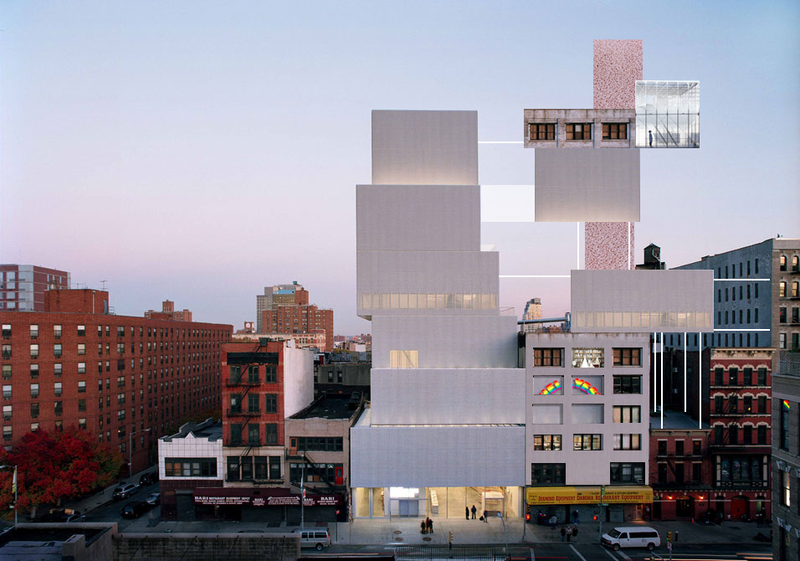 The historical Bowery 231 consists of six floors and meets the double height gallery and lobby floors of the New Museum. For each New Museum gallery, there are two floors in the adjacent structure. The renovated floors match the floors of the existing galleries, and will house new gallery spaces and the artist’s studios. Above the studios are the archives, architecturally revealing the studios below through floor apertures. These apertures reveal the studios to the archives and the archives to the studios. As these interactions are enhanced the visitor becomes the witness through the stairs and the wandering hallways. With the new double height gallery, the space now reveals the original beams and vaulted ceiling structure. This exposure of the original structure is the city and as it moves of becomes a hybrid, becoming an urban timeline with itself. This project through new and existing architecture tries to convey these unique contrasting qualities in NY everyday life, all embraced by the meandering display apparatus that in itself becomes a display. Inside the galleries there is always a constant reference of the archive and or the studios. The wandering apparatus transforms from display to function to structure. In one instance the viewer is in repose with the art work and not far from his/hers eyes art is being at the same time created. A few feet above the viewer sees art being archived and through these double height ceilings and piercing apparatus the life behind is completely expose. 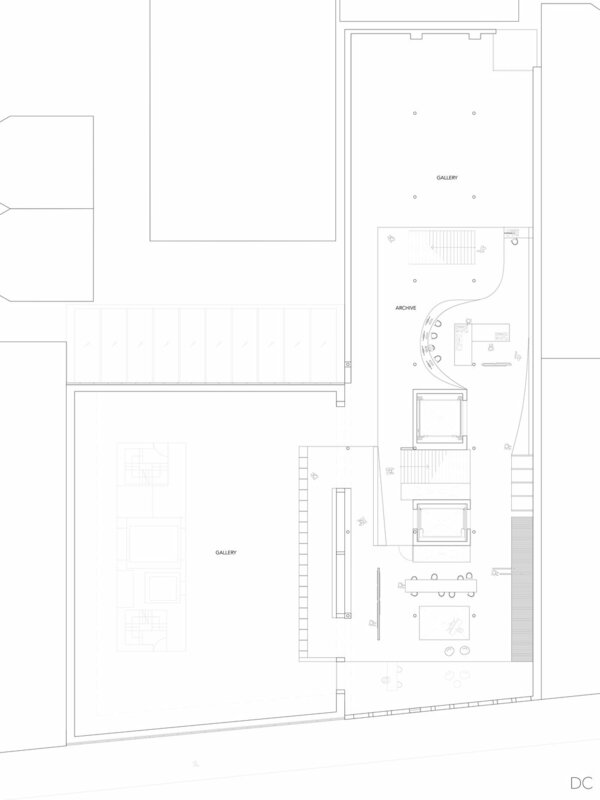 The display apparatus is the gallery, the studio and the archive, and creates the museum. The system is the veins of the spaces and the veins of the institution. Art is created, art is displayed and art becomes history with it.